What Is Lancome Renergie Day Cream Anti-Wrinkle? Lancome Renergie Day Cream comes from one of the most luxurious and most recognized global brands that pioneered anti-aging skincare. It is a richly formulated day time moisturizer that claims to have the power to fight wrinkles and fine lines.Get firmer, more supple skin only from Lancome Renergie Day Cream for US$116 per 1.7 oz. jar. Although this product contains Stearic Acid which could cause skin rashes. What Are The Ingredients In Lancome Renergie Day Cream Anti-Wrinkle? Glycerin: It helps skin retain moisture while reducing inflammation but also can cause skin irritation to sensitive skin. Caffeine: Caffeine constricts blood vessels to reduce redness.It also works as a diuretic, aids in circulation and is also a powerful antioxidant. Paraffin: It helps to provide layer of oil on the surface of the skin to prevent water evaporating from the skin surface. 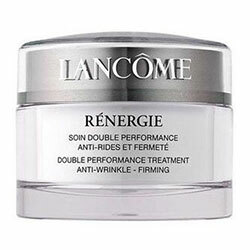 Apply Lancome Renergie Day Cream everyday, after cleansing and toning skin. Apply on skin with sunscreen to protect your skin from harmful UV rays. Use with the Lancome Renergie Night Cream to complement this product’s formulation, for best results. Although customer reviews tells a different story. This product contains powerful moisturizers that can instantly plump up your skin and keep it hydrated for a long period of time. It contains Glycerin which retains skin moisturized while causes itching sometimes. It also contains Soybean Protein that work to moisturize skin and reduce the appearance of fine lines. This product contains parabens that can potentially adversely affect your otherwise normally functioning hormone-regulated body processes. It also contains fragrances and colorants which can be highly irritating to sensitive skin types. This product does not contain sunscreen protection. While it lacks a good line up of the skin aging preventing power of antioxidants and peptides, and mostly contains skin conditioning agents, this product carries a very expensive price tag. It contains Paraffin which may cause pores blocked. When it comes to anti-aging skincare, visible results will never be about the price tag. It has always been about the science behind skincare products. There are plenty of brand which consist of similar ingredients and come in affordable prices. So we would suggest you to keep your search on and look for the product which suits your skin and suits your pocket.